I know that it might seem like my love of leftovers knows no bounds, but this week we are changing things up with an old favourite. 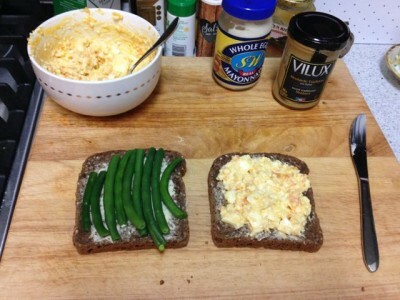 The humble sandwich. A leftovers salad is pretty damn nutritious but it can be pretty fiddly to get together in the haze of 6am sleepyness so when that happens, this little baby saves my life. As I have a deep love for all things creamy and tangy, the egg salad sandwich is what I crave when I decide that the sambo is happening for lunch. I won’t pretend that I got together all these ingredients in the morning but i’m sure if you were super organised you could boil your eggs while you were in the shower or something? Surely? Maybe? Blah. 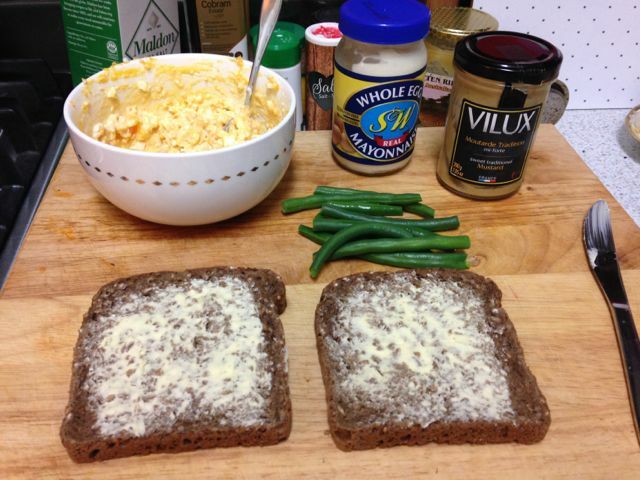 I make mine with dark rye bread, a few green beans for some crunch and a couple of eggs with some dollops of mayo and mustard. Sometimes I go totally crazy and put in wholegrain mustard too! Oh my! All the assembly that is needed then you’re ready to go in record time. Don’t assembly this the night before though or it will most likely go a little soggy by lunch the next day. So peeps, what are you having for lunch today? What is inspiring your lunchbox?